Do y’all remember Austin & Andie from their engagement session earlier this spring? More importantly, do you remember the romantic way Austin proposed? ICYMI, Andie is a instructor for deaf students in Waco ISD, and so when Austin proposed to Andie while celebrating Christmas Eve with her family, he got down on one knee in her parents’ living room and signed his proposal to Andie. Seriously, it’s one of the most romantic proposal stories we’ve heard, and we’ve heard a lot of them as wedding photographers! With such a sweet proposal, it was no surprise to us that Austin & Andie’s wedding day was full of sweet and sentimental touches. Or that Austin & Andie come from such sweet families! One of the first things Andie proudly told us when we arrived at the Arboretum was that her dad BUILT the arbor she & Austin were getting married under. And to see how the arbor transformed with Andie’s wedding day flowers of white hydrangeas, sunflowers, blush roses, and soft blue flowers was truly amazing. It was such a special touch, and one they can take with them into their backyard now! It was also touching to see how Andie’s 3 sisters surrounded her on her big day, helping her with makeup and perfecting the placement of her headpiece. Or how Austin and his mom took a few moments to practice their dancing on the patio in between taking family photos. And while I missed out on all the shenanigans at the groomsmen’s Fixer Upper AirBnB beforehand, Jason assures me that this group of guys was supporting Austin and having a blast doing so! But I think our favorite sweet moments from this wedding are just seeing Austin & Andie experience so many happy emotions throughout the day. Being there when Andie showed her mom her bouquet and started tearing up. Seeing her dad’s look of glee when he first saw Andie, and their tears through the smiles as they hugged. Watching for Austin’s face when he saw Andie for the first time THE ENTIRE DAY when the doors opened as she began her walk down the aisle, and seeing this HUGE smile break out across his face. In fact, just watching Austin & Andie smile at one another through their vows, sneaking glances at each other...you just knew this was a couple that was so in love and so excited to begin their marriage. And when they danced around sporadically to “I’m So Excited” as their final dance, with all their family and friends dancing in a circle around them, it was the perfect ending to the perfect wedding for this sweet couple- a day full of joy, smiles, laughter, and fun, surrounded by their amazing family and friends, beginning their new life together. It was truly an honor to photograph your wedding day. It was such a beautiful day full of sweet moments that we hope you carry with you in your memories for years to come. May the love and smiles you had for each other on your wedding day grow bigger with each anniversary! Gather around, friends, because I’m going to tell you the story of one of the most fun and loving weddings. Ever since Fawn searched #dfwweddingphotographer on Instagram and found us, our relationship with her and Randell has been like we were old friends. From texting us pictures of their dogs, to a skype call with no sound, to hanging out with them at their engagement portrait session, at every interaction they have treated us like long-lost BFFs. So as we traveled to photograph their wedding in McKinney, Texas last Thursday, we were so excited to be with them again. And it became instantly clear the way Randell & Fawn treated us was the way they treated everyone. As we spent time with the bridal party that morning, we saw first-hand how Randell & Fawn had collected a tribe of friends who felt like family. Add these friends to their close-knit family, and Randell & Fawn had a large group of loved ones who would do anything for them and were excited to celebrate them on their wedding day. This love shared by everyone wasn’t the only beautiful element of the day, though. Randell & Fawn had done an amazing job with all their wedding planning and details. This was our first time experiencing Stone Hall at The Springs in McKinney. It is such an amazing venue in the North Dallas area, designed perfectly for weddings. The meticulously landscaped outdoor ceremony site, the reception hall with it’s high ceiling and wood beams, all the gorgeous nooks and spots for portraits, no wonder it’s in such high demand! And Fawn’s wedding day details enhanced the beauty even more. Her family friends helped her design and build all the bouquets and floral arrangements, and the navy, blush, and pearl design palette complimented the bright green of the outdoor venue and the wood accents within the reception hall perfectly. The details weren’t the only things Randell & Fawn had planned for the day. 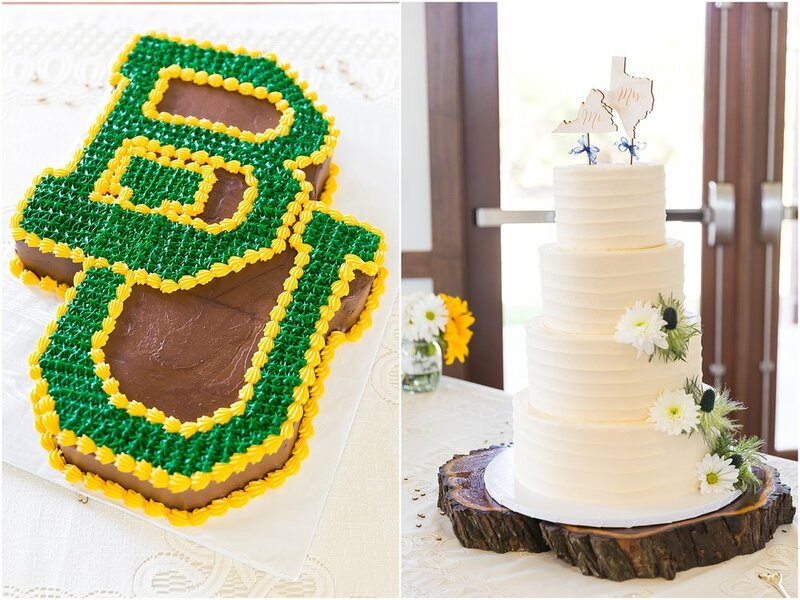 This bride and groom had some fun surprises up their sleeves! One surprise Fawn had for her soon-to-be hubby (surprise Randell!) was a Darth Vader inspired mini-photo session with her and the groomsmen. She even got the junior groomsmen and ring bearer in on the action, pretending to be her stormtroopers. The fun continued into the ceremony, with Fawn walking down the aisle to “Isn’t She Lovely.” At Fawn’s secret request, the officiant began the ceremony by reciting the “Mawwaige” speech from The Princess Bride. But perhaps the most fun surprise of all was the pink chrome for her and black for him light-up soled shoes Randell & Fawn wore to their reception. The lights were dimmed for their big entrance, and as Chris Brown’s “Forever” was played by the talented DJ Dan Quinn, Randell & Fawn danced their way down the stairs and through the reception to the dance floor, lighting the way with their flashing shoes. Randell & Fawn’s wedding day was filled with romantic moments as well. Randell did not want see Fawn before she came down the aisle, but they did want to have a moment of connection before. So they had a “first touch” in the upstairs hall of the venue. Holding hands around the corner, they talked about whether they were nervous, how they couldn’t wait to kiss one another, and then prayed together. For their vows, they recited traditional vows “to have and to hold...for better or worse.” But before repeating those vows, they shared heartfelt, hand-written personal vows to one another. These personal vows were so precious and meaningful, full of laughter and holding back tears as they professed their love and commitment to one another. 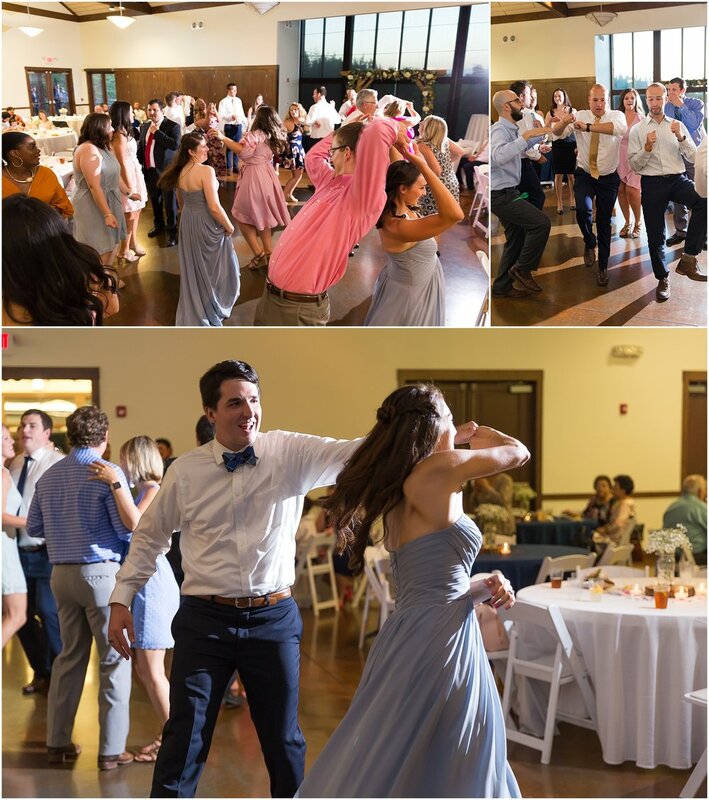 And before the night was over, they asked DJ Dan to clear the dance floor so they could have one final dance by themselves on their wedding day. 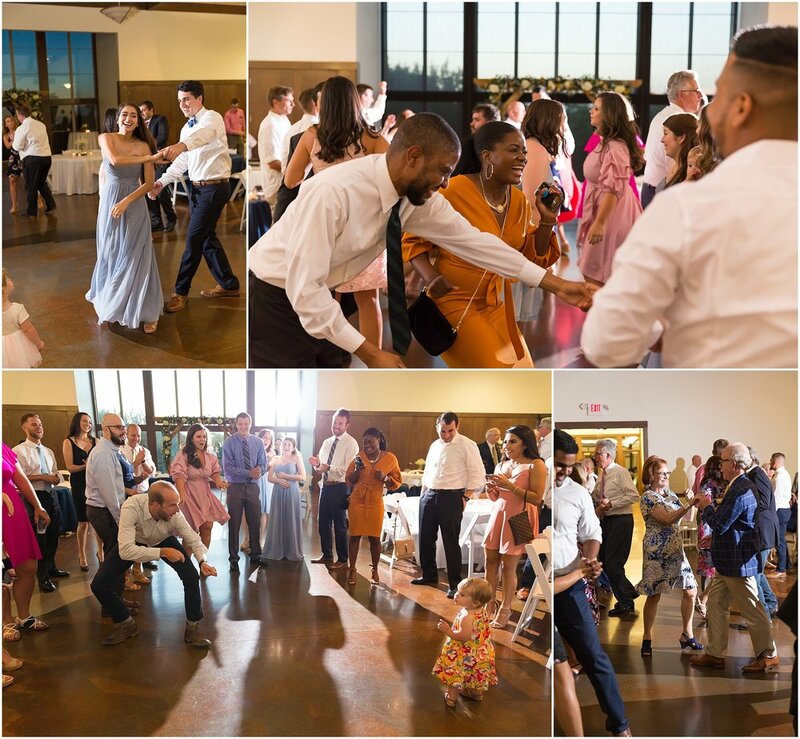 Seeing Randell & Fawn dance together as husband and wife on the empty dance floor was a touching glimpse at how much love this couple has for one another, and the amazing life they are going to share together. If you enjoyed Randell & Fawn's wedding story, check out other wedding stories featured on the blog! Only hours before this session, the sky was full of ominous thunderclouds and rain was falling in various areas of Waco. Jason and I watched the storms roll in from our porch and wondered if we would be able to make this session work. Family sessions in rain can be fun, and rain on a wedding day can actually make for some amazing shots. But rain for bridal portraits isn't preferred, especially since it's the first time the bride's worn her perfectly altered dress outside and she needs it to still look perfect a month later on her wedding day. So we watched and we waited. Then the rain moved on and the sky cleared, and the only thing left in it's wake was a very humid and muggy evening. 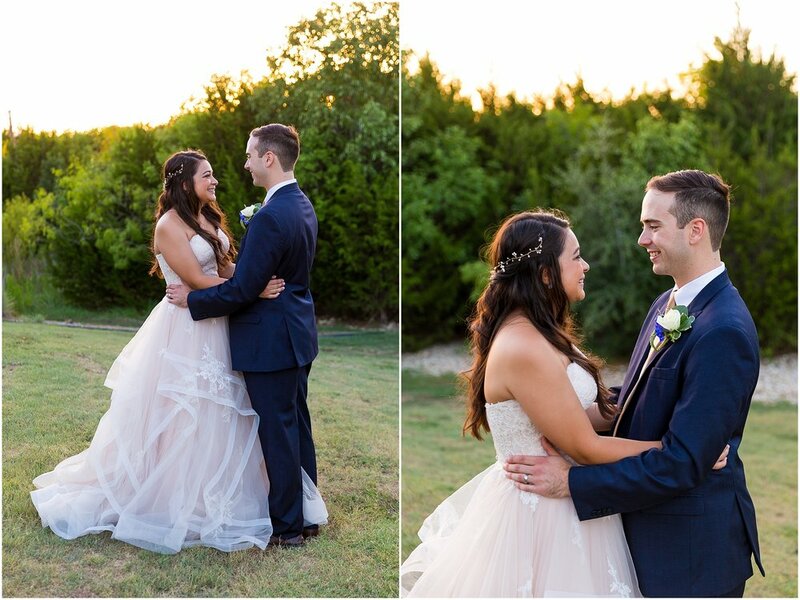 We met Rachel and her fiance, Mike, through our involvement with the Waco Wedding Professionals group. They both help front the Texas Heatwave Band, an amazingly talented cover band who take any reception or party to the next level. From our very first meeting, we knew they were so fun and were excited to be a part of their wedding day team. They both have this infectious energy, and heart-warming smiles, so you can't help but have fun when you're around them. Therefore, we knew that even if there had been rain, even if there was some mud and crazy humidity and mosquitoes (and OH MY WORD, were there mosquitoes! ), Rachel was going to have a blast at her bridal portraits and we were going to have a blast being around her. And we were right. She showed up wearing her gorgeous dress, enthusiastically showing us her blinged-out, blue-suede Bagdley Mischka shoes. She brought along her sweet mama and fun-loving stepdad, and it became apparent where Rachel's warmth and fun spirit came from. Her fun and warm spirit were so easy to capture on camera, and she knocked this session out of the park. Rachel, you were a true joy to work with and an even more beautiful bride. Thank you for letting us into your circle!